Hello friends and I am so very happy to have you here. Another week has gone by and fall is quickly approaching each day. 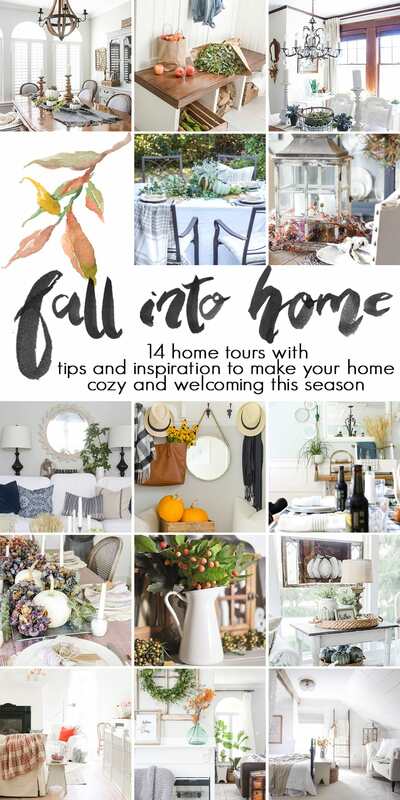 Today I am joining some amazing ladies that I truly consider friends in the Fall Into Home Tour hosted by Rachel at Maison de Pax . Each of these ladies are so talented and kind – I can’t wait for you to see for yourself! I finally found some real pumpkins and picked up a few! I quickly sprinkled them throughout the kitchen (although if I am being honest, one of those is a gourd ;). 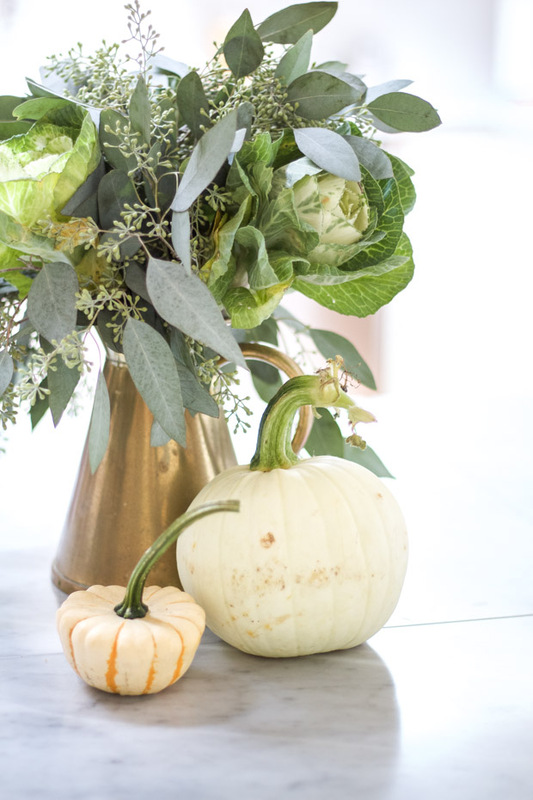 Pumpkins can stand alone as easy and simple decor, they make a beautiful statement without too much fuss. I bought another round of eucalyptus at the store for less than five dollars and it is still going strong! 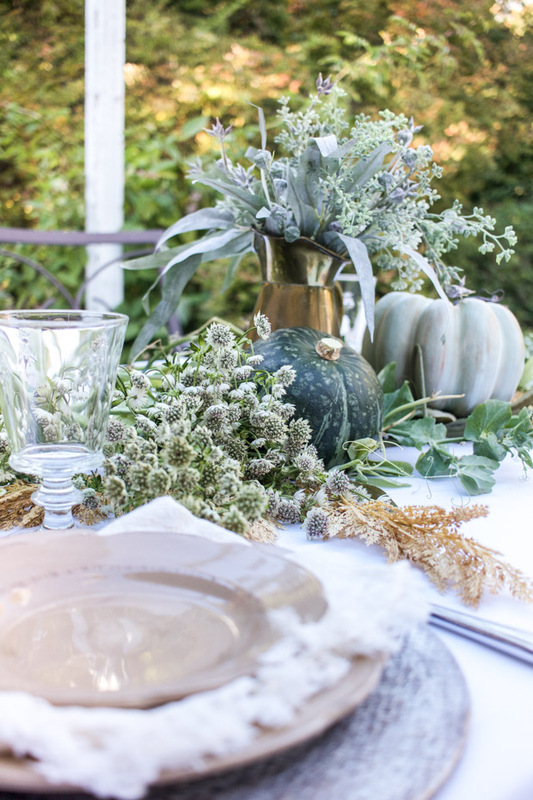 This time it is a seeded variety… Having green anytime throughout the year makes your home feel inviting and cozy. This can be store bought or even plucked from the outside for nothing. Fresh herbs line the counters and make the kitchen smell like it is ready to be cooked in. Instead of cooking, this time we are baking up some waffles. It is so very true that baking makes everything smell good and is the best way to make anyone feel at home! Making Belgian waffles is a family tradition of ours once the school year starts up again. The kiddos just love it (I mean who wouldn’t when syrup is involved, lol) and we intend to keep this Saturday ritual for many years to come. This delightful treat fills the air with an aroma of vanilla; it’s nothing fancy or difficult either. We use our favorite recipe and dress it with whatever may be on hand, which happened to be blueberries this time. Z and Evy dig right in and Wyatt eagerly awaits for a lucky accident to fall. This may be his favorite spot in the house. 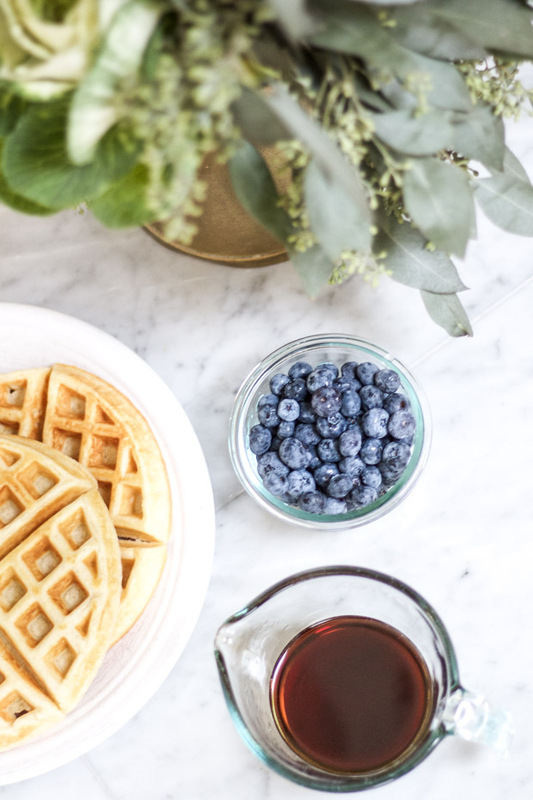 And even though hot coffee and warm breakfast treats make Saturdays something to look forward to, the little bit of sleeping in on the weekend may be just as sweet! 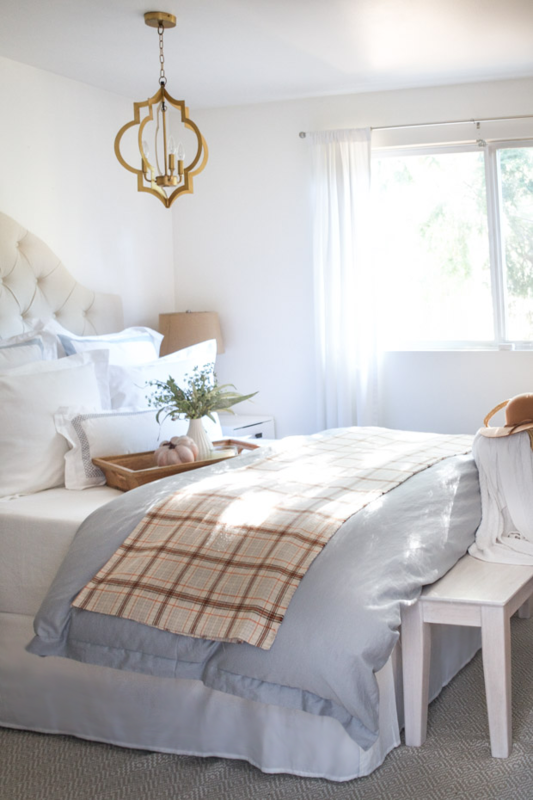 I introduced autumn into our newly refreshed bedroom by adding an unfinished plaid flannel atop the bedding. 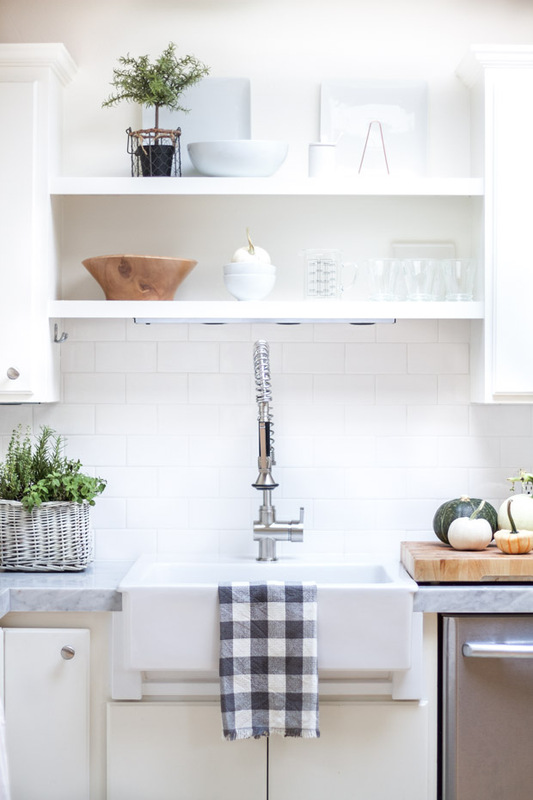 I have used plaid flannels many times throughout our decor (as seen here). 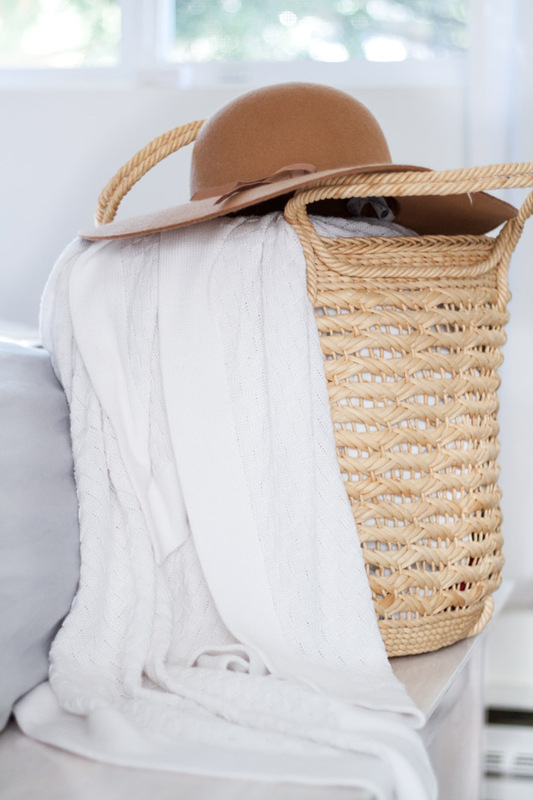 These flannel scarves or blankets are a wonderful option to change things up while on a budget. I bring out my floppy hats and layered scarves; I always look forward to dressing for this time of year. 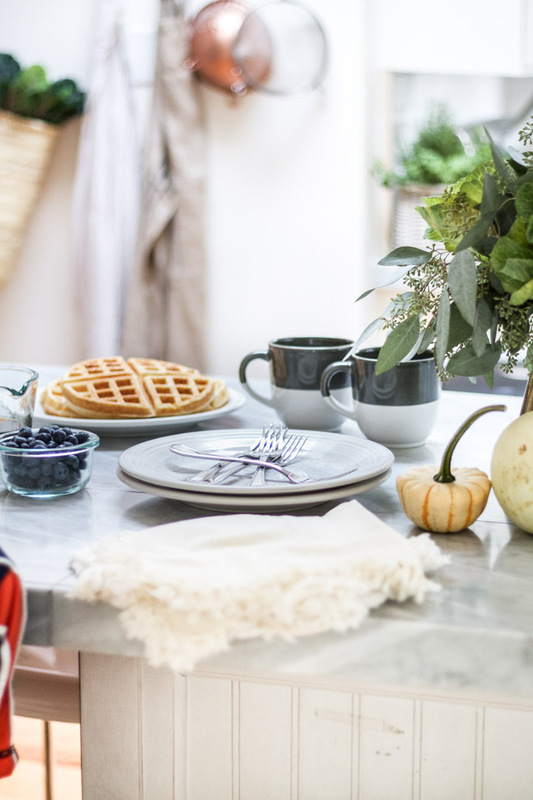 Yay for sweater weather and decorating with things you use everyday! 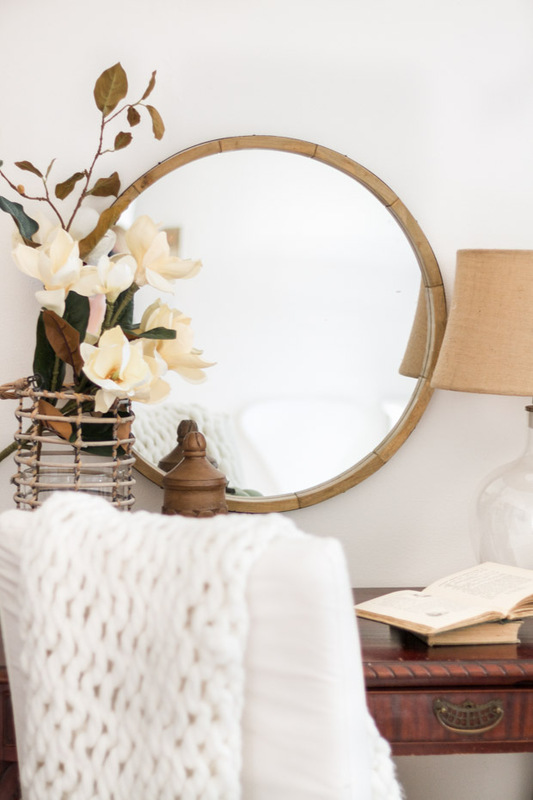 Next to our bed sits an antique vanity with blooming magnolias… Branches and stems always hint at fall, as they mimic the changing seasons. A couple more faux pumpkins, chunky knit blankets (always an instant dose of cozy texture) and a confetti of sunshine warm up a space easily. The sun barely filters into this space at this time of year, but when it does it really is magnificent. Speaking of bedrooms, I recently finished up our girl’s space and thought I would share it prettied up for the season with a baby pumpkin and some rich greens. 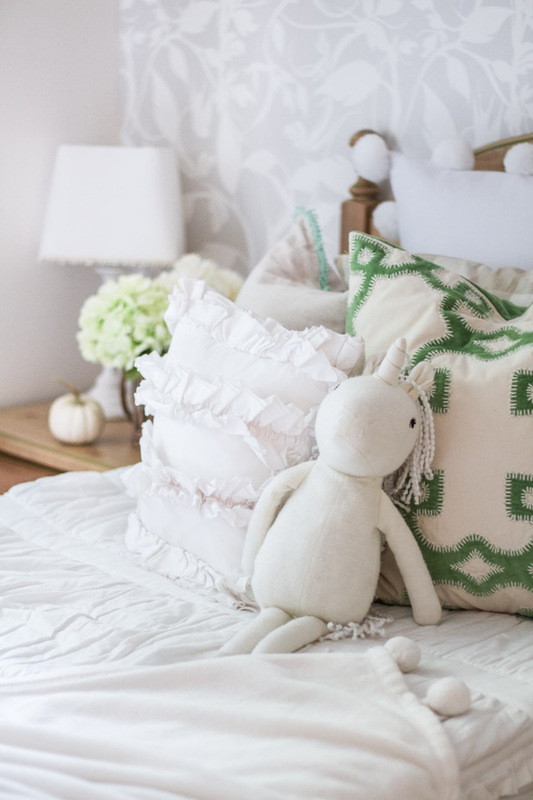 I wanted her room to fit her sweet personality and her name’s meaning, the “grazing meadow”. Somehow, the bold green and the leafy wallpaper (gifted from Milton and King) seemed fitting for both. Spaces should be extensions of “you” and not what is in trend, nor do they have to be expensive to look beautiful (such as this DIY canopy). Every room deserves a small pumpkin so of course, hers got one too. She was over the moon to help decorate the space ;). Just before the weather becomes increasingly cold and time outside is spent less and less, I wanted to make use of our recently finished patio (here). This has become one of our most enjoyed hangouts throughout the summer and I’m not ready to let go of it quite yet. 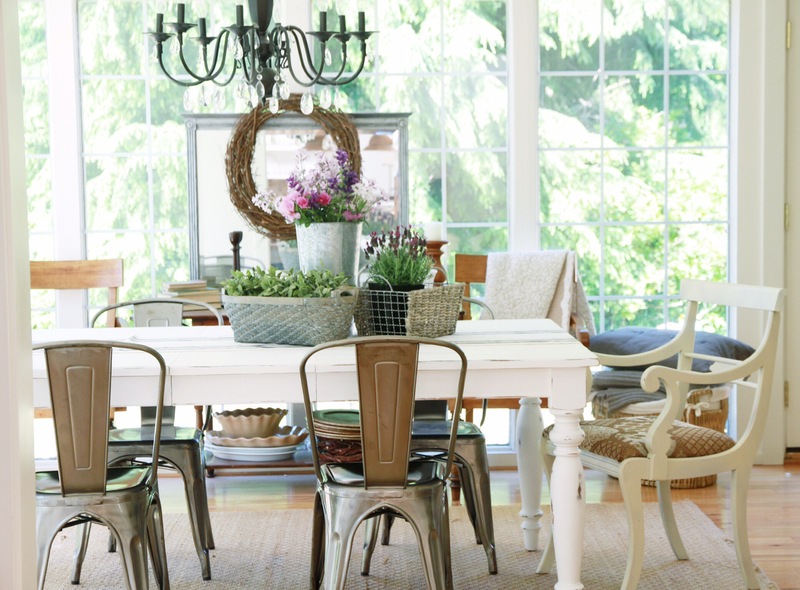 Dining areas are meant to be set up for good conversation, warm food and lots of memories. 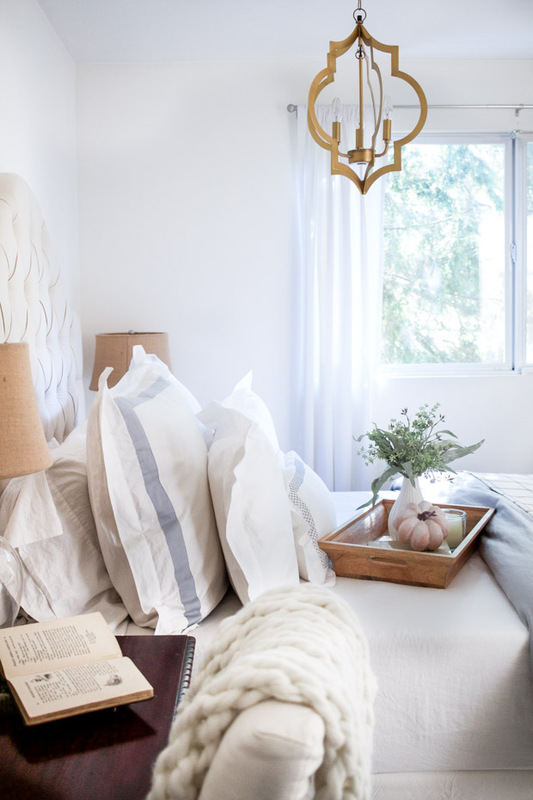 Blankets and pillows always make a space cozy and ready for visiting even if the space is outdoors. 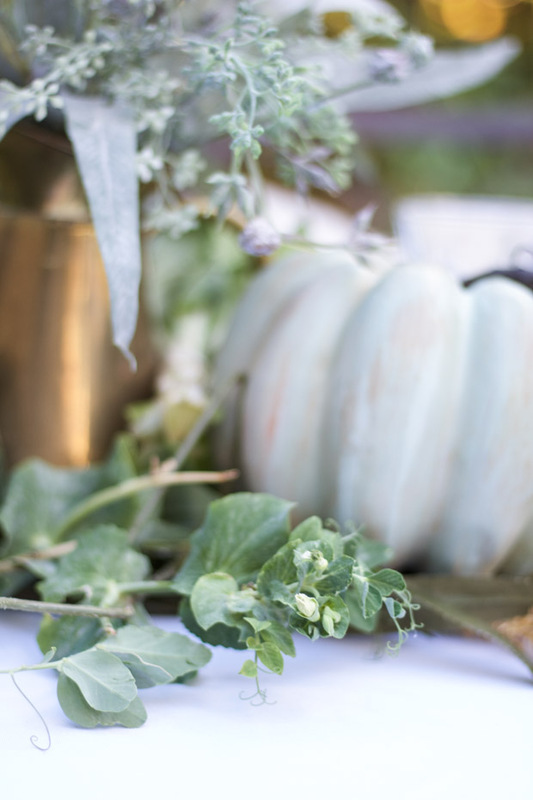 Pumpkins, gourds, cabbage and eucalyptus line the table for an easy centerpiece. I even used the last of our snap pea vines to adorn the arrangement. 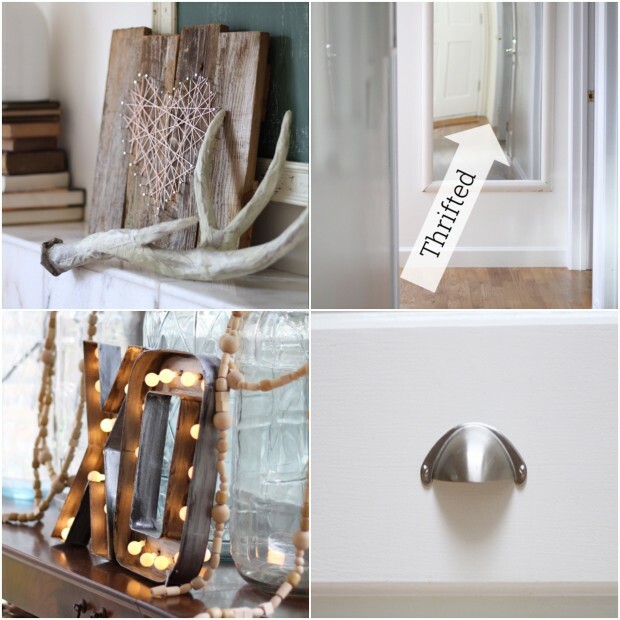 Using what you have throughout and outside the house makes decorating inexpensive and doable. 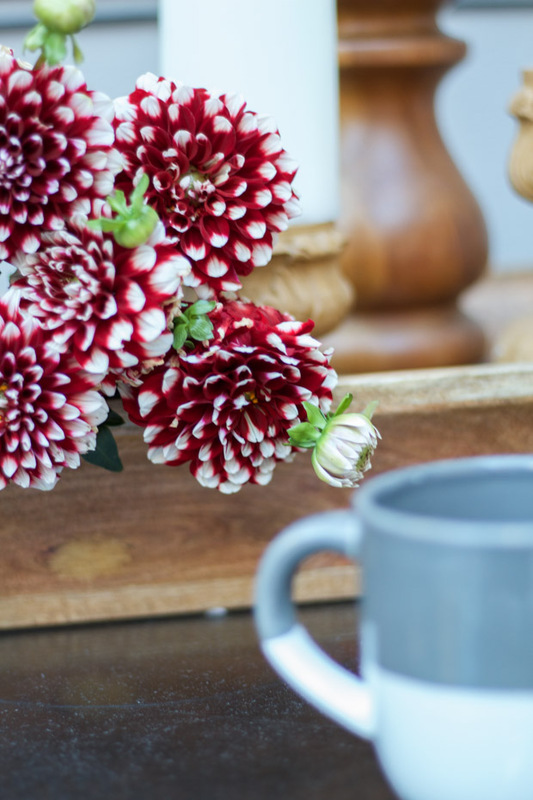 Coffee, candles and fall flowers allow comfortable “after dinner” enjoyment and laughter around a fire. 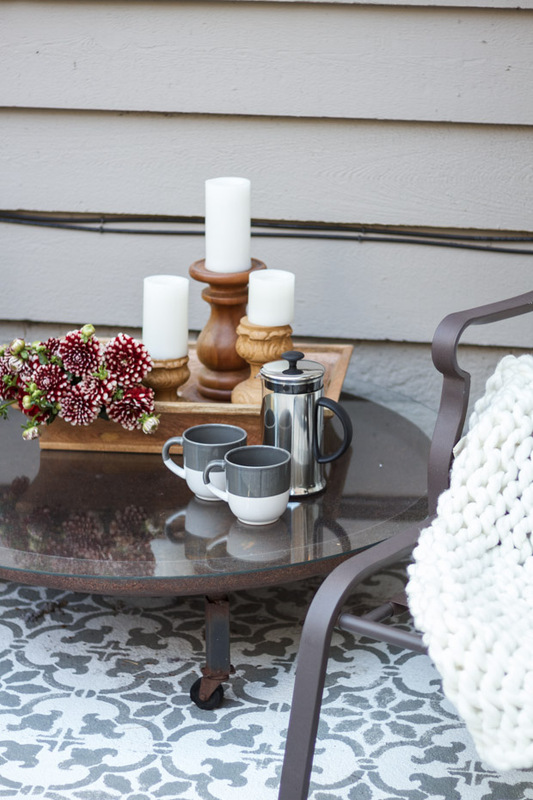 Details are simple but they are special and that is what makes the most out of each spot on this patio or most importantly throughout our entire home. Thank you so much for being here and taking the time to visit. I hope you will come and visit again soon as I love opening up our home during these tours and sharing it with you. 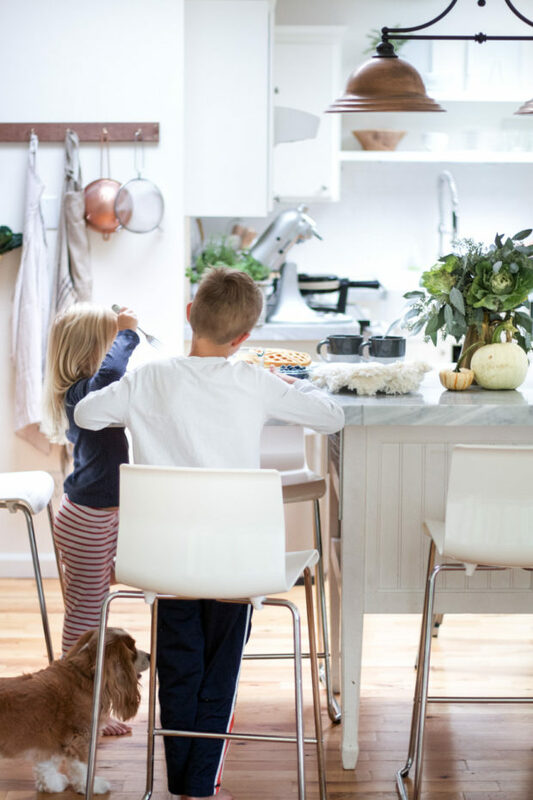 I have experienced that there is so much joy to be found in the everyday of our homes, the love we put into them and how we share that love with our family and friends. A very big thank you to Rachel at Maison de Pax for hosting this lovely tour and make sure to check out the entire fall tour below. Have a wonderful week all! i just love your style, annie! 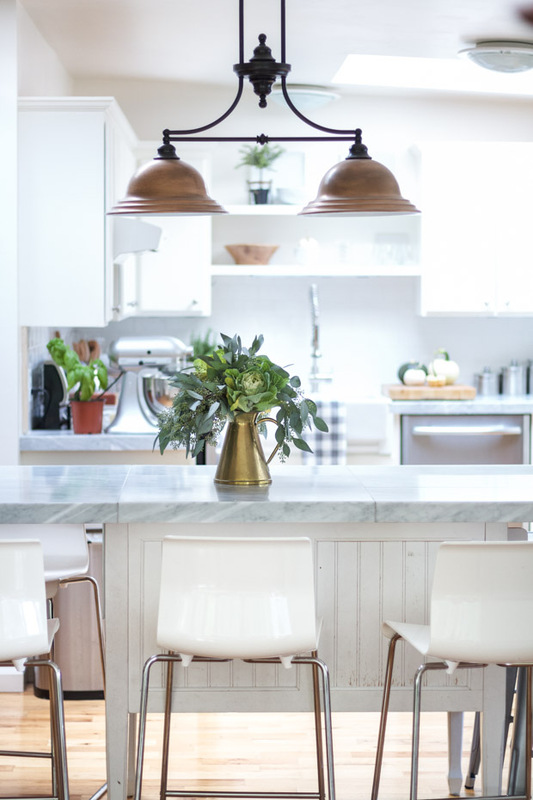 and i have to say, in a world where so many people are doing farm/neutral, your home and blog stand out to me because your style is fresh, textured, and has a modern touch, too! i hope that comes across like i mean it to! Oh my goodness Cassie, that is such a sweet compliment, thank you for sharing that… it sure is appreciated and I am so happy you stopped by! 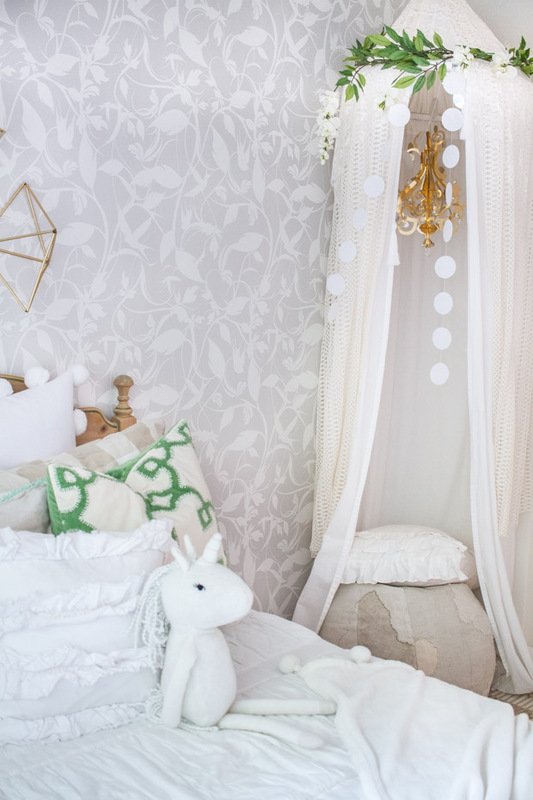 Annie your daughter’s room is darling! 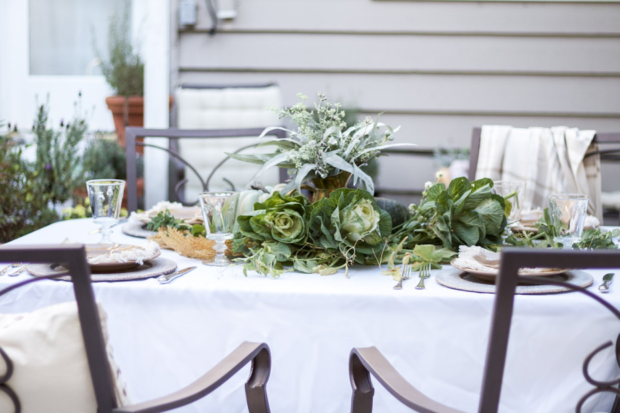 Love that green pillow you added in– really ties in that gorgeous green garland on the canopy. 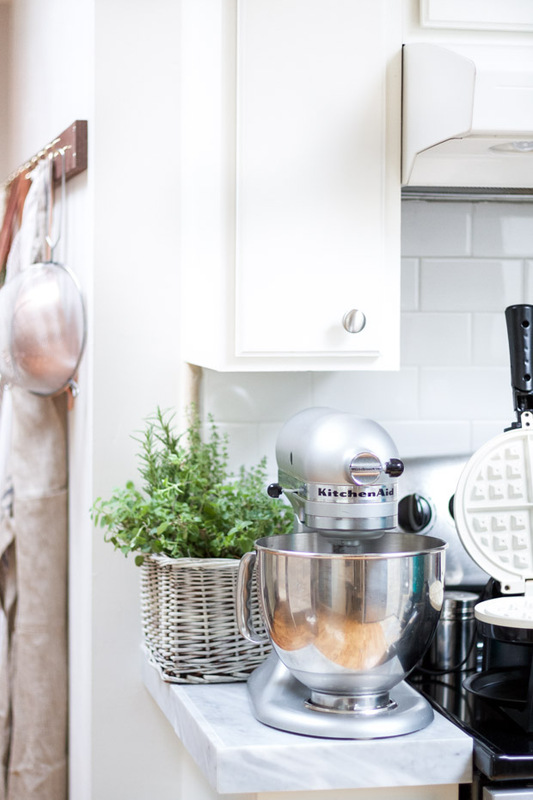 I also love your kitchen and your waffle tradition. Waffles always remind me of visiting my brother because he always makes them when we visit– we don’t have a waffle maker so it’s a treat. 🙂 Love your patio too– I wanna come over! Rachel – thank you friend! They really are a treat and I loved enjoying your beautiful tour today! 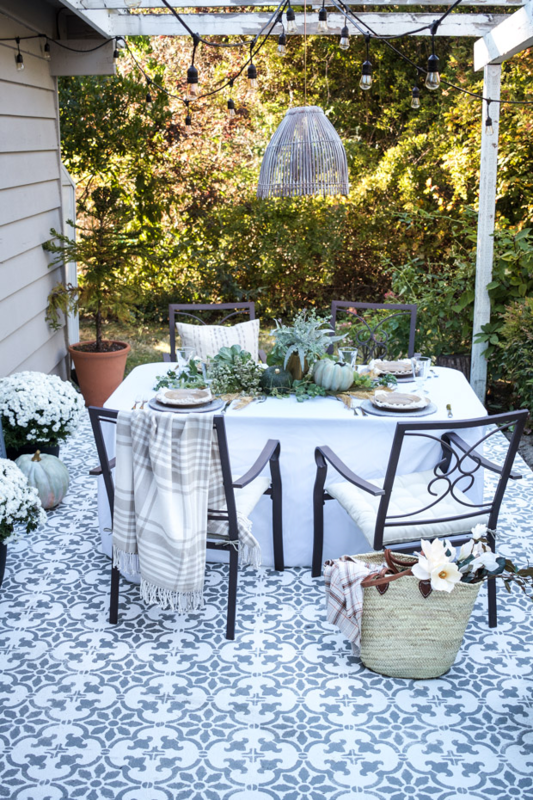 That patio dining space is perfection. Who doesn’t want to have dinner there every night? Loved it all. Mae thank you! We really have enjoyed the change of scenery! Annie, I have admired your beautiful home for awhile. It is inviting and cozy and the love you put into it is so evident. Thank you for showing us you don’t have to spend a lot of money to your house a home! Debbie thank you so so much for joining me hear and knowing that puts a big smile on my face! Thank you! 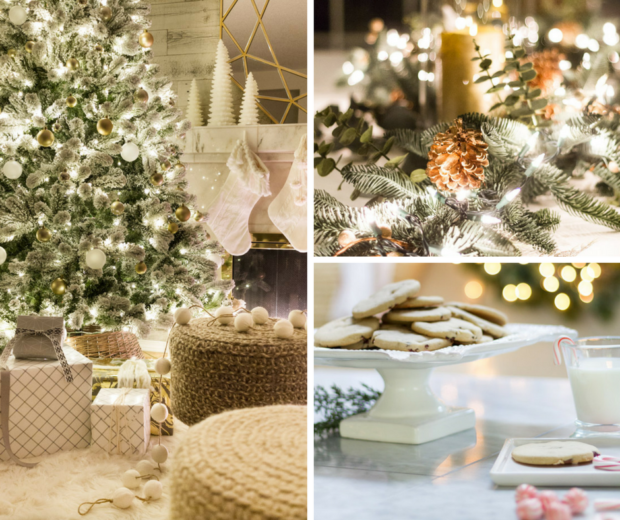 Your blog and pics are so beautiful! 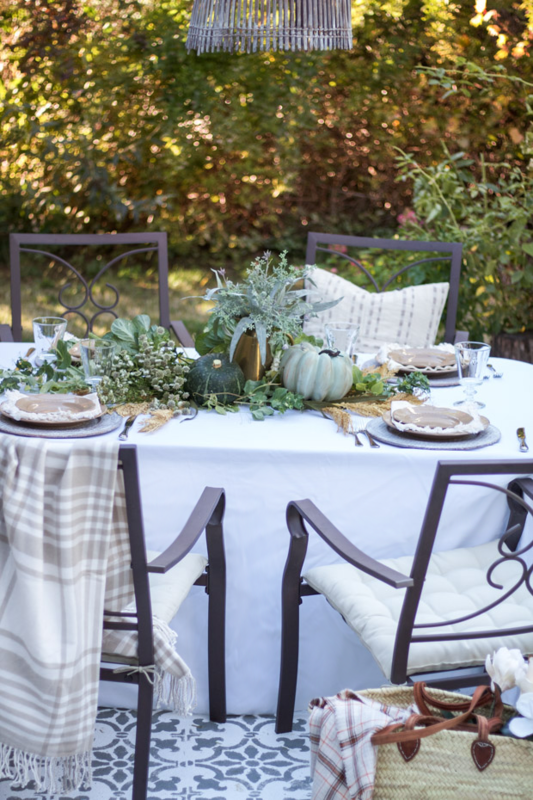 Being a newbie and coming from the Bless’er House looking at all the homes decorated for fall I have to say I am loving your blog. 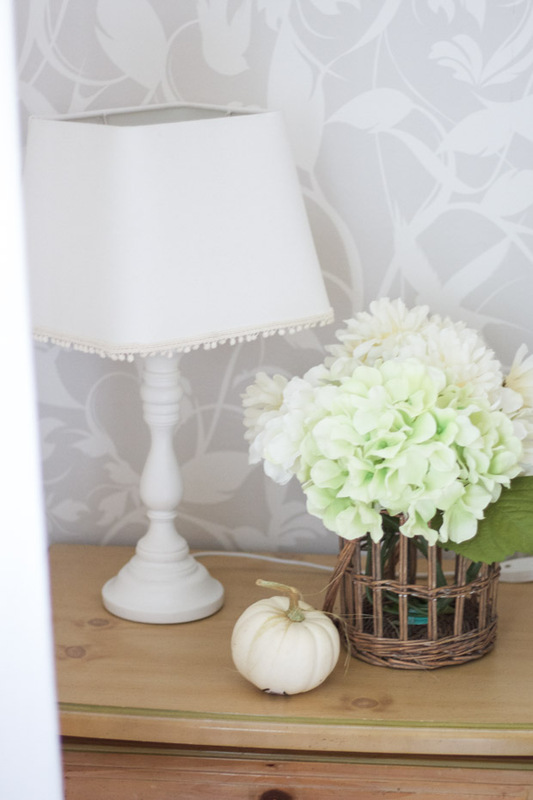 Your inviting words and cozy decor makes reading your blog such a joy. The love of home and family is wonderful to see and read. Great job!!!! Oh my goodness, Annie! I’m so in love with this tour! And I completely melted over your daughter’s room. Sooo sweet! Annie Girl, You are so Talented!!! 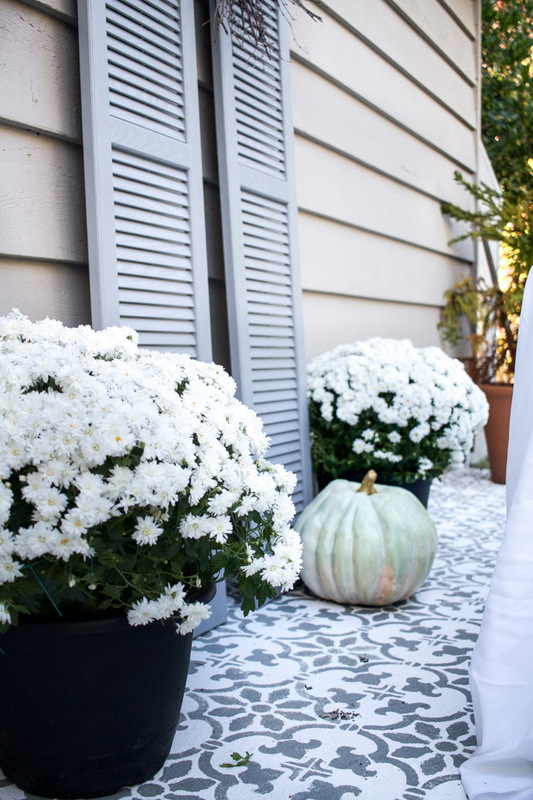 Your home looks amazing for Fall and it has that special touch that you are so good at. Loved it! So gorgeous, Annie! 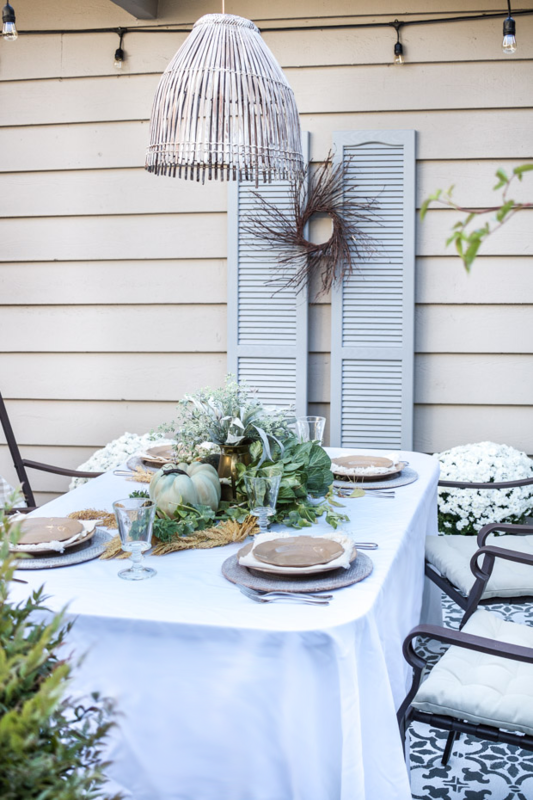 Your back patio is simply stunning! 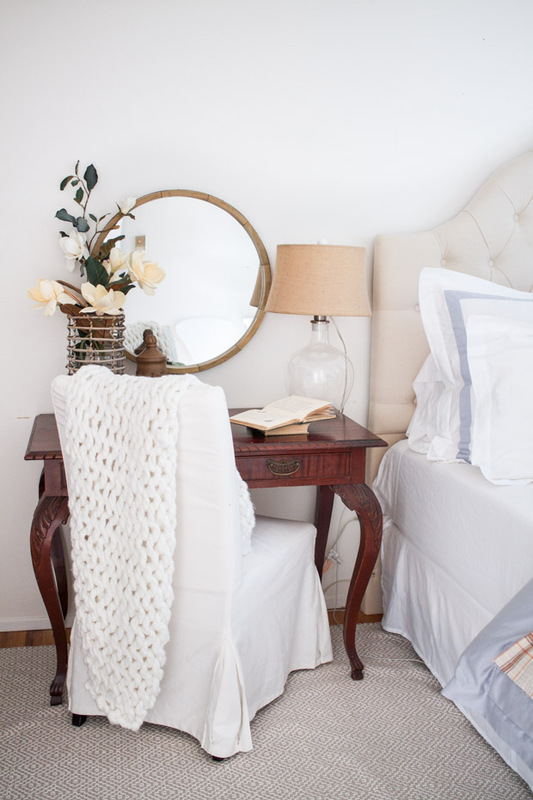 I also loved your daughter’s room… I just love it all! 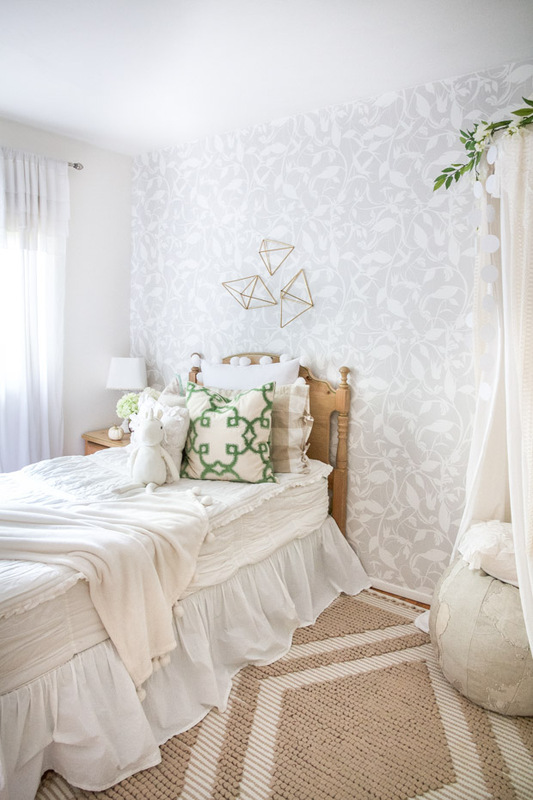 Annie, your daughters room is magical and turned out just beautifully! Love that wallpaper! 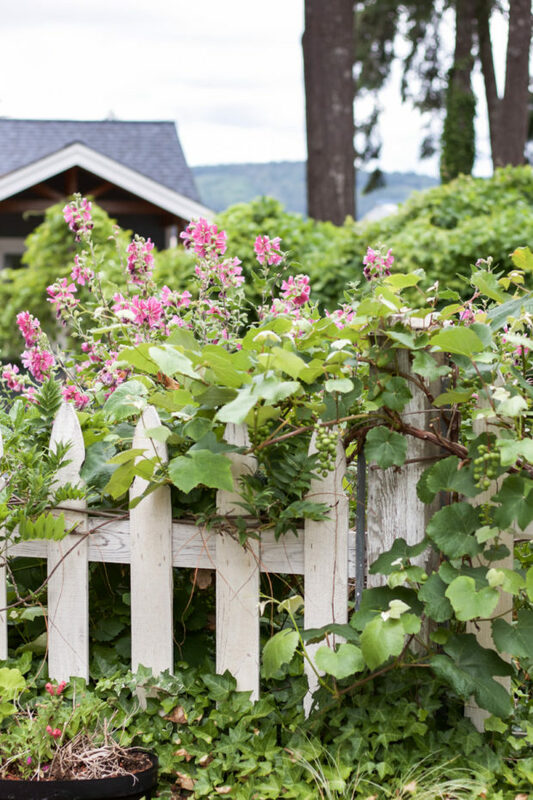 Love all of the brassica and eucalyptus and your porch is just lovely! you’re having such a beautiful fall! Summer thank you so much!